The Major Changes are for Bolt Action Rifles, Semi-Auto Pistols and Revolvers. After 28th June, these CANNOT be produced with Dry-Firing or Cycling Actions. You will still be legally allowed to keep dry-firing actions in your collect after 28th June. After the 28th June 2018 if you wish to sell, trade, give, transfer etc. a deactivated firearm it must conform to Regulation (EU) 2018/337 and have the appropriate UK issued Proof House Certificate. (again as last time, Flare Pistols, Mortars, Rocket Launchers, and Artillery fall outside of the regulation). The Law on Deactivated Firearms was changed on the 8th April 2016 by the European Parliament under Regulation (EU) 2015/2403. 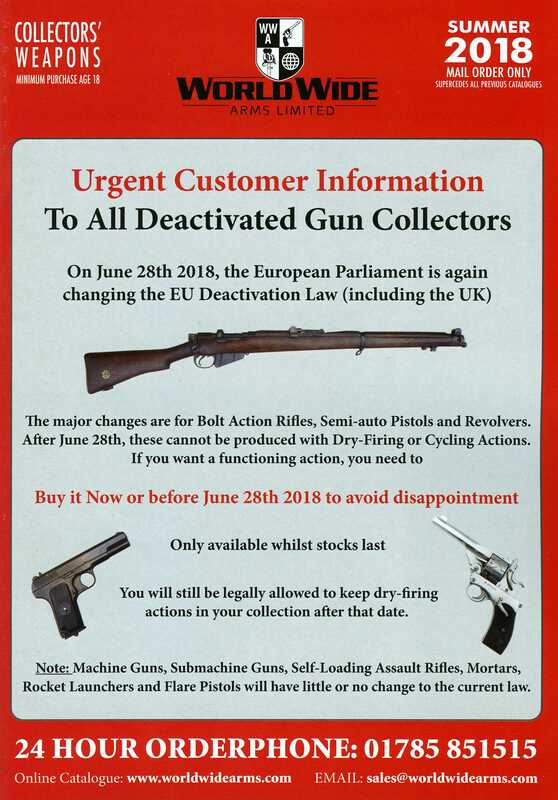 Since the 8th April 2016 it has been illegal to sell a deactivated gun which does not have an EU endorsed deactivation certificate (other than Flare Pistols, Mortars, Rocket Launchers, and Artillery which fall outside of the regulation). Some people have been totally ignoring this law as there was no penalty in force. On the 2nd May 2017 the penalty for breaking the above law was introduced. Bolt face chamfered at 45 degrees, firing pin shortened, firing pin hole welded up, bolt lugs chamfered at 45 degrees. Barrels have 6 holes drilled on underside of barrel close to the chamber. Hardened steel rod welded in covering two thirds of barrel. Chamber slotted on underside. Hardened steel peg welded across chamber. Rifles with detachable magazines have a hardened steel pin welded across magazine well to prevent the insertion of a standard magazine. Magazine top modified so that it can be inserted and removed. 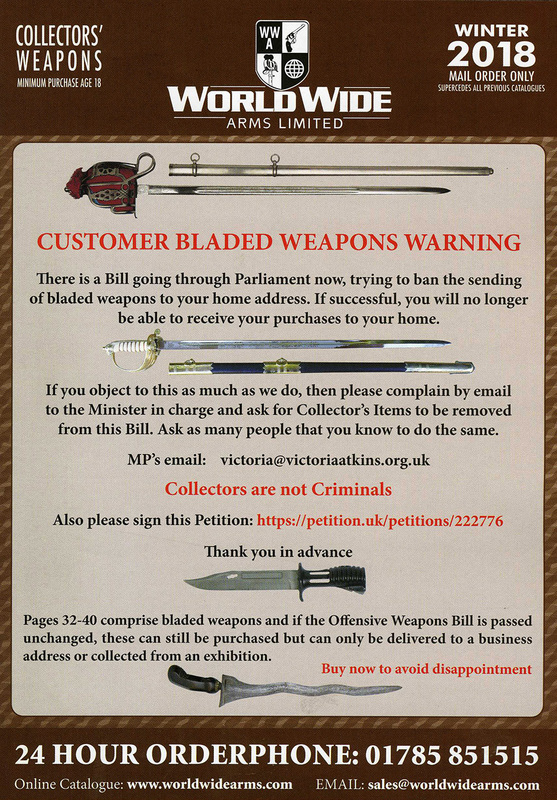 Integral magazines remain unaffected. All work is carried out internally or under cover so the appearance is virtually as original. The rifles can be cocked and dry fired. This system is virtually the same as the old UK system except it now has the EU/UK Deactivation Certificate from the Birmingham/London Proof House. YOU WILL NOT BE DISAPPOINTED. Bolt face chamfered at 45 degrees, firing pin shortened, and firing pin hole welded up. Barrels have 3 holes drilled in barrel close to the chamber. Chamber slotted, hardened steel rod welded in place covering two thirds of the barrel. Any Feed ramp machined away. The Frame has two thirds of slide rails removed, top slide locking lugs removed, top slide captivated to frame. Hardened steel pin welded across magazine well to prevent the insertion of a standard magazine. Magazine top modified so that it can be inserted and removed. All work is carried out internally or under cover so the appearance is virtually as original. The Pistols have moving parts and can be cocked & dry fired. They now have the EU/UK Deactivation Certificate from the Birmingham/London Proof House. YOU WILL NOT BE DISAPPOINTED. Barrels have a short V slot and are pinned to the frame, chamber slotted. Hardened steel rod welded in place covering two thirds of the barrel. Firing pin shortened, firing pin hole welded up. Cylinder walls removed internally and filled with a steel ring, cylinder captivated to frame. Revolvers have moving parts and can be cocked & dry fired. They now have the EU/UK Deactivation Certificate from the Birmingham/London Proof House. YOU WILL NOT BE DISAPPOINTED. Bolt reduced by 50% and welded into the receiver. Barrels drilled with 6 holes and chamber slotted. Hardened steel rod welded in covering two thirds of barrel. Barrel welded to frame. Frame with some internal welding. Hardened steel pin welded across magazine well to prevent the insertion of a standard magazine. Magazine top modified so that it can be inserted and removed. Where applicable cocking levers remain movable. The deactivation is quite similar to the previous UK spec except more parts are allowed to move. They now have the EU/UK Deactivation Certificate from the Birmingham/London Proof House. YOU WILL NOT BE DISAPPOINTED. Bolt removed and bolt carrier reduced by 50% and welded to receiver. Barrels drilled with 6 holes and chamber slotted. Hardened steel rod welded in covering two thirds of barrel. Barrel pinned and welded to frame. Gas system disabled by cutting and welding. Receiver with some internal welding. Hardened steel pin welded across magazine well to prevent the insertion of a standard magazine. Magazine top modified so that it can be inserted and removed. Bolt reduced by 50% and welded to bolt carrier which is welded to the receiver. Barrels drilled with 6 holes and chamber slotted. Hardened steel rod welded in covering two thirds of barrel. Barrel pinned and welded to frame. Gas system disabled by cutting and welding. Some internal components welded. Where possible cocking levers remain movable. Rifles with detachable magazine have a hardened steel pin welded across magazine well to prevent the insertion of a standard magazine. Magazine top modified so that it can be inserted and removed. Integral magazines remain unaffected. IN SHORT MANY OF THE ABOVE CATAGORIES HAVE CHANGED VERY LITTLE FROM THE ORIGINAL UK SPECS; MOST WORK IS INTERNAL OR UNDERCOVER SO AS TO RETAIN THE ORIGINAL APPERANCE. Buy with Confidence. We still offer our 30 day Money Back Guarantee.